Many Veterans Day deals continue today, Monday, November 12, 2018. Below is a roundup of national deals, including links to websites where you can confirm the deal and find further information. Titles in GREEN are for deals good on Monday, November 12, 2018. As always, it is advisable to check your local restaurant to confirm they are participating in the national deal. Another Broken Egg Cafe has a free Patriot French Toast Combo and Coffee for the military on Monday, November 12, 2018. Good only at participating cafes; must show Military ID; valid 11/12/2018 only while supplies last. Another Broken Egg has about 70 locations. The chain announced their Veterans Day deal on Facebook. For the 11th consecutive year, Applebee’s Neighborhood Grill & Bar will honor veterans and active members of the United States military by offering each a free meal at any of the nearly 2,000 Applebee’s restaurants in the U.S. on Veterans Day, Sunday, November 11, 2018. The chain says it expects to serve one million free meals this Veterans Day. *Available on November 11, 2018 at participating Applebee’s only. Beverages and gratuity not included. U.S. Veterans and active duty military simply show proof of military service. Proof of service includes: U.S. Uniformed Services ID Card, U.S. Uniformed Services Retired ID Card, current Leave and Earnings Statement (LES), veterans organization card (i.e., American Legion, VFW), photograph of yourself in uniform, wearing uniform, DD214 and citation or commendation. Limit 1 meal per U.S. veteran or active duty military. Dine-in only. Not valid with other coupons or discounts. Menu may vary by location. For more details see the Applebee’s Veterans Day Announcement. Applebee’s has nearly 2,000 locations. Arooga’s Grille House & Sports Bar is saluting America’s veterans with a free meal on Monday, November 12, 2018. All veterans and troops are entitled to one complimentary item from a fixed menu which includes some of Arooga’s favorites such as their famous Buffalo Pretzel, Arooga’s Chopped Salad, Sriracha Chicken Caesar Salad, BBQ Pulled Pork Sandwich (served with fries, chips, or coleslaw), Grilled Cheese and Creamy Tomato Basil Soup, Spicy Italian Wrap or Sub (served with fries, chips, or coleslaw), Original Boli, and boneless wings (10) tossed in any one of their more than 30 sauce creations. The special is good at all locations (excluding Patchogue, NY). Arooga’s announced the Veterans Day deal in a Press Release. Arooga’s has 19 locations in the Connecticut, Rhode Island, New York, New Jersey, Florida, Pennsylvania, and Massachusetts. Back Yard Burgers is offering a free Back Yard Classic Burger to all active duty service members and veterans on Veterans Day, Sunday, November 11, 2018. No purchase is necessary for veterans to get this complimentary burger. A military ID, discharge papers, proof of service or being in uniform is required. The Back Yard Burgers Classic Burger features one-third pound, 100 percent Black Angus beef, which is flame-grilled to achieve that signature back yard taste. All Back Yard Burgers are made to order, and topped with your choice of garden-fresh lettuce, tomatoes, pickles, onion, ketchup, mustard, and mayonnaise. Back Yard Burgers announced the Veterans Day deal in a News Release. Back Yard Burgers has 51 locations in 11 states. Bar Louie invites vets and active military personnel to enjoy a free meal on Veterans Day. From open to close on Sunday, November 11, 2018, every Bar Louie throughout the country will offer veterans and military personnel a free burger or flatbread up to a $15 value when they show a valid military I.D. “We value our servicemen and women who have put their lives in front of ours to protect and preserve the freedom offered within our country. We have many Bar Louie team members who have served. We’re grateful and want to thank our veterans as they walk through our doors,” said Tom Fricke, Bar Louie Chief Executive Officer. Bar Louie announced the Veterans Day deal in a News Release. Bar Louie has 132 locations. BJ’s Restaurant has a free meal for veterans on Veterans Day. Get a complimentary entree priced up to $12.95 plus a soft drink. Must present Military ID. Valid for dine in on Sunday, 11/11/2018 only. Not valid for Take Out or Delivery. For more details see the BJ’s Veterans Day page. BJ’s has about 200 locations. *Terms of Veterans Day meal: Complimentary entree up to $12.95 and Free Dr Pepper beverage. Offer valid for Current and Retired military personnel. Black Angus Steakhouse has a special deal on a steak dinner for veterans on Monday, November 12, 2018. The restaurant chain, which was founded by a veteran on the premise of providing an attainable steak dinner for all, will offer an 8 oz. Top Sirloin, mashed potatoes, broccoli with garlic butter and a non-alcoholic beverage – all for just $9.99. The offer is valid Monday, November 12th from open to close. All military personnel who produce a valid military ID or proof of military service are eligible to receive this special offer. For additional info please visit: https://www.blackangus.com/ Black Angus has 44 locations across California, Washington, Arizona, New Mexico, Alaska and Hawaii. Bob Evans Restaurants is celebrating Veterans Day by offering the choice of one of six free meals to veterans and active duty military personnel on Sunday, November 11, 2018. This year, veterans and active duty military personnel will be able to select free breakfast, lunch, and dinner menu items on Sunday, November 11, 2018 at all Bob Evans restaurants. Soup and Salad Combo – Farmhouse Garden Side salad with choice of soup: Chicken-N-Noodles, Hearty Beef Vegetable or Cheddar Baked Potato. Guests wishing to enjoy one free meal on Veterans Day must provide proof of service. For more details see the Bob Evans Veterans Day announcement. Bob Evans has about 500 locations across 18 states, primarily in the Midwest, mid-Atlantic and Southeast regions of the United States. Bombshells Restaurant & Bar has free meals on Monday, November 12, 2018. The chain will provide free meals and soft drinks for veterans and a 20% discount on meals and soft drinks for accompanying family members, on November 12. All Bombshells are open 11AM to 2AM for lunch, happy hour, dinner and late night. Veterans and active service members always receive 20% discount on meals and soft drinks every day at Bombshells. Veterans and active service members are asked to present military ID, such as U.S. Uniformed Services or Retired ID Card, Current Leave and Earnings Statement, veterans’ organization card (e.g., American Legion or VFW), or military discharge (DD214). Bombshells will also set a “Missing Man Table” in each location. The table, which grew out of concern for Vietnam War POW/MIAs, is a place of honor set up in U.S. armed forces dining facilities in memory of fallen, missing, or imprisoned military. In addition, veterans are encouraged to bring a photo (ideally 8×10) in uniform which Bombshells plans to frame and permanently hang on a “Wall of Honor” in each restaurant. Bombshell has six locations in Houston, Dallas and Austin, TX. Buy one meal and get another meal free with this Boston Market coupon good today, Monday, November 12, 2018. CLICK HERE for your Boston Market coupon. Good for a free Individual Meal when you buy another meal and a beverage. If ordering online use promo code 37585. Boston Market announced the coupon on the Boston Market Home Page. The coupon celebrates Veterans Day but there is no restriction on who can use the coupon. As a thank you for sacrifice and service, Bruegger’s Bagels has a free coffee for all veterans and active military personnel on Monday, November 12, 2018. Military ID is required. The chain announced the Veterans Day deal on the Bruegger’s Home Page. Brugger’s has about 260 locations. Bubba Gump Shrimp Co. has 10% off every day for veterans plus 25% off all merchandise now through November 20, 2018. For more details see the Bubba Gump Facebook Page. Buffalo Wild Wings has a complimentary order of wings with a side of fries for active and retired armed services members on Veterans Day. * At participating U.S. locations only. Limit one (1) per person. Offer valid for one (1) small order of traditional or boneless wings and one (1) side of fries. Dine-in only on November 11, 2018. Must present acceptable proof of military service, which include: permanent or temporary U.S. military ID cards, veteran’s card, a photograph of yourself in military uniform, or dine-in at a participating location in uniform. The chain announced the Veterans Day special in This Email. Buffalo Wild Wings has about 1,240 locations. Veterans and active military are entitled to a free entree on Veterans Day at California Pizza Kitchen. On Sunday, November 11, 2018, choose a free entree from a special Veterans Day menu of pizzas, pastas and salads*. You can find the Veterans Day menu and more details at: California Pizza Veterans Day Menu. Veterans will also receive a card to redeem for a buy one, get one free offer on pizza, pasta, or salad during a return visit Nov. 12-18 (while supplies last)**. California Pizza Kitchen has about 250 locations in more than 30 states and 11 countries. The chain announced their Veterans Day deal on Facebook. *Offer valid for veterans and active military only. On 11/11/18, choose one entrée from our special Veterans Day Menu, dine-in only (menu offerings may vary by location). No substitutions. Cannot be combined with any other offer or promotion. Please come in uniform or bring your military ID or other proof of service. Offer valid at participating locations; not valid at locations in Guam, airports, stadiums, Grand Sierra Resort in Reno, the Mirage Hotel in Las Vegas or international locations. Offer valid on 11/11/2018 only. **Veterans special offer card available while supplies last. Offer valid for a Free Pizza, Pasta or Salad (of equal or lesser value) on your next visit with the purchase of any Pizza, Pasta or Salad; excluding alcohol, tax and gratuity. Valid for dine-in only. Offer valid at participating locations; not valid at locations in Guam, airports, stadiums, Grand Sierra Resort in Reno, the Mirage Hotel in Las Vegas or international locations. Not valid with any other offer or promotion. One time use only. No cash value. Not valid on delivery. Offer excludes add-ons or substitutions. Limit one offer per table. Offer valid 11/12-11/18/18 only. Veterans and active duty military get a free appetizer at Carrabba’s restaurants with any purchase on Sunday and Monday, November 11-12, 2018. Proof of service required. Not redeemable at some locations. The Italian restaurant chain announced the deal in an email to subscribers. Carrabba’s has about 250 locations. *Visit New York Prime, California Dreaming, The Tavern at Phipps, Chophouse New Orleans, Carolina Roadhouse, Joey D’s Oak Room, Chophouse ’47 or Gulfstream Café on Sunday, November 11, 2018 with a valid military ID or proof of service to enjoy a free entrée from the regular dinner menu (excluding AQ items, Porterhouse, alcohol and tax, dine-in). For more details see: Veterans Day Offer at CentraArchy. Charlie Brown’s Steakhouse has a free lunch for veterans from 11:30 am to 3 pm on Monday, November 12, 2018. Choose from a special menu. ID required. For more details see the Charlie Brown’s Facebook Page. Charlie Brown’s Steakhouse has about 14 locations. Chicken Salad Chick is offering a free Chick Special and regular size drink to any Veteran or active-duty military personnel who join them on Monday, November 12, 2018. The chain announced their Veterans Day deal on Facebook. Chicken Salad Chick has about 95 locations. For a complete menu and more details see Veterans Day at Chili’s. Chili’s has about 1,600 locations. Chipotle Mexican Grill has a buy-one-get-one promotion on Veterans Day. The BOGO promotion will be available for all active duty military, reserves, national guard, military spouses and retired military with valid ID, at all restaurants in the U.S. from open to close on Sunday, November 11, 2018. The BOGO is valid on burritos, bowls, salads and taco orders. *This promotion is valid on in-store purchases only and may not be combined with other coupons, promotions or special offers. Limit one free menu item per military ID, subject to availability. Free item requires purchase of an entrée item of equal or greater value and is to be collected by valid ID holder only. Chipotle announced the annual Veterans Day BOGO on Facebook. Chipotle has about 2,400 locations. Get a free buffet with Military ID at Cicis Pizza on Veterans Day. Coupon required; for your Cici’s coupon CLICK HERE. The chain announced the Veterans Day deal on Facebook. Good only on Sunday, November 11, 2018. Contact your local Cici’s to confirm participation. Cici’s has about 440 locations in 35 states. Claim Jumper restaurants have a free meal for all veterans and active military on Monday, November 12, 2018. Items on the Veterans Day menu include Chicken Pot Pie, Classic Cheeseburger, and Meatloaf. Show proof of military service. Dine-in only. Beverage, tax and gratuity not included. For menu and more details see the Claim Jumper Veterans Day announcement. Claim Jumper has about 40 locations. Country Kitchen is offering a free Country Scramble to active military and veterans on Monday, November 12, 2018 (the day after Veterans Day). One free Country Scramble per qualified guest. Dine-in only. Cannot be combined with any other offers or discounts. For a list of participating locations and more information, see: Country Kitchen Veterans Day. Country Kitchen has about 170 locations in 26 states. Veterans dining at Cracker Barrel on Veterans Day receive a complimentary slice of Double Chocolate Fudge Coca-Cola Cake or a Crafted Coffee beverage. On Nov. 11, 2018, Cracker Barrel will offer veterans a choice of a complimentary piece of Double Chocolate Fudge Coca-Cola Cake for dessert or a Crafted Coffee, such as the new limited-time Southern Praline Latte, or one of the menu staples, such as the signature Goo Goo Cluster Latte, Latte, Vanilla Latte, Caramel Latte, or Mocha. The family dining chain announced the Veterans Day deal on the Cracker Barrel Veterans Day page. Cracker Barrel has about 650 locations. Denny’s is inviting active, inactive and retired military personnel to come in for a free Build Your Own Grand Slam the Monday after Veterans Day. The deal is good from 5 a.m. to noon on Monday, November 12, 2018. At participating locations nationwide, diners with a valid military ID can receive a complimentary Build Your Own Grand Slam, which includes four breakfast items such as new fluffy Buttermilk Pancakes, eggs cooked to order, sizzling bacon strips, seasonal fruit or hash browns. *Free Build Your Own Grand Slam for veterans and military personnel 11.12.18 from 5 am – noon. Includes active, non-active and retired military personnel. Dine in only. Must show valid military ID or DD214 at participating restaurants. Selection and prices may vary. Offer limited to Monday, 11.12.18 5 am to noon. Not valid for online orders. While supplies last; restrictions apply. Beverages not included. No substitutions. Denny’s announced the Veterans Day deal on the Denny’s Home Page. Denny’s has about 1,600 locations in the U.S.
On Sunday, November 11, anyone who shows a military ID at participating Dunkin’ Donuts restaurants nationwide will be offered a free donut of their choice with no purchase necessary, while supplies last. Limit one per customer. The chain announced the free donut offer on Facebook. No purchase necessary. While supplies last. Limit one per customer. Offer available in-store only. Not available for orders placed using On-the-Go Mobile Ordering through the Dunkin’ Mobile App. All military veterans and active duty personnel with valid military ID can receive a free meal from a special Veterans Day menu at East Coast Wings + Grill. Good all day on Sunday, November 11, 2018. Dine-in only. For more details see the announcement on Facebook. East Coast Wings has about 40 locations. All military veterans and active duty personnel with valid military ID can receive a free Big Cheese burger at Farmer Boys on Monday, November 12, 2018. Dine-in only. For participating locations and more details see the announcement on Facebook. Farmer Boys has about 90 locations. Fatz Southern Kitchen invites all veterans and active military to join them for a free World Famous Calabash Chicken basket on the Monday after Veterans Day – Monday, November 12, 2018. All veterans and active military can enjoy a complimentary World Famous Calabash Chicken basket, which includes specially seasoned, buttermilk-marinated and hand-breaded Calabash chicken tenders served with steak fries with no additional purchase required. In addition, Fatz will host Military Appreciation Month in November with all veterans and active military members getting 25% off their entrée each time they visit Fatz. Firebirds Wood Fired Grill has a BOGO for the military on the Monday after Veterans Day. Veterans and active military get a free entree with the purchase of another meal on Monday, November 12, 2018. Terms: Dine with a Veteran or Active Duty Service Member on Monday, November 12 and their lunch or dinner is our treat. Reserve your table today. Please bring a valid form of military ID or wear your uniform to receive a complimentary entree. Accepted forms of ID include: U.S. Uniform Services Identification Card, U.S. Uniform Services Retired Identification Card, Current Leave and Earnings Statement (LES), Photograph of you in uniform, Wear your uniform, Veterans Organization Card (i.e. American Legion and VFW DD214). Firebirds announced the Veterans Day deal on their Veterans Day Page. Firebirds has about 50 locations. All military veterans and active duty personnel with valid military ID will receive 50% off their meal at Fogo de Chao on Veteran’s Day weekend (November 9-12, 2018). Also up to three additional guests in the party will receive 10% off their meals. Offer is valid at all U.S. and Puerto Rico Fogo de Chão locations. Beverages, dessert, tax and gratuity not included. For more details see the Fogo de Chao Announcement. Fogo de Chao has about 35 locations. Friendly’s is treating veterans and active military to a free breakfast, lunch or dinner on Veterans Day. Eligible guests are invited to to enjoy a free Big-Two-Do breakfast or a free All American Burger for lunch or dinner. Breakfast comes with Brioche French toast, buttermilk pancakes or two slices of toast; applewood-smoked bacon or two sausage links, and two eggs. Veterans will also be treated to a fresh cup of coffee. For veterans preferring to dine at Friendly’s for lunch or dinner, the restaurant is showing their appreciation with a complimentary All-American Burger with fries and a beverage . Offer is valid for dine-in guests only at all Friendly’s locations and is limited to one breakfast or lunch/dinner entrée per person on Sunday, November 11, 2018. For more information see the full Friendly’s Facebook Page. Friendly’s has about 380 locations. 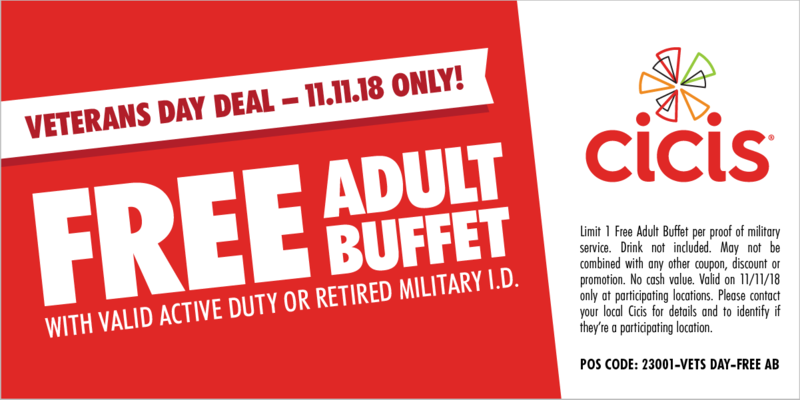 Golden Corral announced that on Monday, November 12, 2018 (the Monday after Veterans Day), the buffet chain will once again serve more than 330,000 active duty and retired military personnel with a free dinner buffet and beverage. A tradition started in 2001 to celebrate our nation’s heroes, Military Appreciation Night has served more than 5 million complimentary meals to military personnel and generated $13 million dollars in guest contributions to support the military and veterans community. For more details see the Golden Corral Military Appreciation Page. Golden Corral has about 200 locations. *This Budweiser BBQ Cheddar Burger was created by a military veteran and is solely available for the month of November, with a portion of the proceeds benefiting charities that support veterans and their families. Good on Sunday, November 11, 2018. Hooters announced the Veterans Day deal on Facebook. Hooters has about 430 locations. IHOP Restaurants nationwide will again serve a complimentary stack of patriotic Red, White & Blue Pancakes to the military. On Monday, November 12, 2018, Veterans and Active Duty Military can enjoy three of IHOP restaurant’s Buttermilk Pancakes with glazed strawberries, blueberry compote and whipped topping for free at participating U.S. locations between 7 a.m. and 7 p.m. The free offer on November 12 is available to retired and active duty military personnel with proof of military service from 7:00 AM to 7:00 PM at participating IHOP locations nationwide. Proof of military service includes: U.S. Uniformed Services ID Card, U.S. Uniformed Services Retired ID Card, Current Leave and Earnings Statement (LES), veterans organization card (e.g., American Legion, VFW, etc. ), photograph of self in U.S. military uniform, wearing uniform, DD214, military dog tags, and citation or commendation. This offer is dine-in only. For more details see the IHOP Facebook Page. IHOP has about 1,650 locations across the U.S.
Joe’s Crab Shack has 20% off for the military on Veterans Day. Veterans and active military get 20% off their check (not including alcoholic beverages) on Veterans Day. Joe’s Crab Shack announced the Veterans Day deal on their Veterans Day Page. Joe’s Crab Shack has about 70 locations. As a thank you for sacrifice and service, Krispy Kreme has a free doughnut & small coffee for all veterans and active military personnel on Veterans Day. Offer valid November 11, 2018 at participating US Krispy Kreme stores only and is subject to product availability. Limit one offer per guest per visit. Not valid with any other offer. Not valid at grocery or convenience stores. Offer valid for anyone who identifies themselves as a veteran or active military personnel (no ID required). The chain announced the Veterans Day deal on Facebook. Krispy Kreme has about 1,000 locations. Little Caesars Pizza is offering all veterans and active military a free $5 HOT-N-READY Lunch Combo from 11:00 a.m. to 2:00 p.m on Veterans Day, Sunday, November 11, 2018. The Lunch Combo features four slices of Little Caesars popular Detroit-style DEEP!DEEP!™ Dish pepperoni pizza, paired with a 20-ounce Pepsi product. The pizza chain announced the promo on Facebook. Little Caesar’s has about 4,332 locations. Logan’s Roadhouse has a free meal for military personnel and veterans from 3 – 6 pm on Veterans Day. Choose any item on the American Roadhouse menu, such as Grilled Chicken, Sirloin Steak, or Roast Beef. *Not available in NC, SC, or Augusta, GA locations. Menu will vary at CA locations. One free meal from $8.99 American Roadhouse Meals menu with proof of service. Beverage Not Included. Dine-in only. Valid Veterans Day, Sunday, 11/11/18, from 3-6 pm. Show proof of military service. Dine-in only. Beverage, tax and gratuity not included. For menu and more details see the Logan’s Roadhouse Veterans Day announcement. Logan’s Roadhouse has about 200 locations. For Veterans Day LongHorn Steakhouse will offer a complimentary appetizer or dessert, and guests that dine with a veteran will also receive 10 percent off their meal. Military ID and coupon are required; CLICK HERE for your LongHorn coupon. LongHorn announced the Veterans Day special in This Email. LongHorn Steakhouse has about 480 locations. Macaroni Grill has a free Mom’s Ricotta Meatballs + Spaghetti entrée for veterans on Veterans Day. All veterans and active military can enjoy this complimentary meal simply by presenting military ID or proof of service. Mom’s Ricotta Meatballs + Spaghetti includes house-made beef, veal, pork and ricotta meatballs sprinkled with romano cheese, topped with imported Pomodorina sauce and served over imported, bronze-cut spaghetti. Macaroni Grill announced the Veterans Day deal on Facebook. Macaroni Grill has about 100 locations. Each Main Event center features state-of-the-art bowling, multi-level laser tag, billiards and an arcade game gallery featuring more than 100 of the latest interactive video games. *Valid military ID or proof of service required. Must show proof of military service with either a military ID card, Veterans Affairs card or discharge papers. Not valid with any other offer. Limit one per day/per center/per military member. Valid from open to close on Sunday Nov. 11, 2018. Main Event announced the Veterans Day deal on Facebook. Main Event has about 40 locations. As a thank you for sacrifice and service, Marie Callender’s has a free Magnificent Six for all veterans and active military personnel on Monday, November 12, 2018. Military ID is required. The chain announced the Veterans Day deal on the Marie Callender’s Facebook Page. Marie Callender’s has about 65 locations. Max & Erma’s has a free Cheeseburger Meal for veterans and active military on Veterans Day. For more details see the announcement on Facebook. Max & Erma’s has about 50 locations. McCormick and Schmick’s Seafood Restaurants will thank U.S. military veterans and Gold Star family members with a complimentary lunch or dinner on Sunday, November 11, 2018. McCormick & Schmick’s traditionally offers the free meal to the military on Memorial Day and on Veterans Day. Good for active and retired military, also good for Gold Star honorees (parents and spouse). Reservations are recommended. Military ID is required. Choose from Salmon, Fried Shrimp, Parmesan Chicken, Beef Medallions, and other items. Menu may vary at some locations. Good for lunch or dinner, dine-in only. Verification of service is required. Reservations are highly encouraged, as tables fill up quickly. Guests can visit www.McCormickandSchmicks.com to find a location near them and to book their reservations today. You can find the full Veterans Day menu and more details at the McCormick and Schmick’s Veterans Day website. McCormick and Schmick’s has about 45 locations. Menchie’s, North America’s largest self-serve frozen yogurt franchise, will honor servicemen and women with free frozen yogurt on Veterans Day, Sunday November 11, 2018. All veterans and active duty military will receive their first six ounces free when they present their valid military ID or proof of service at the time of purchase. The Veterans Day offer was announced on the Menchie’s Home Page. Menchie’s has about 530 locations. Native Grill & Wings, a restaurant chain known for its 20 wing flavors guests can order by the individual wing, will be offering veterans and active duty service men and women any one menu item for free all day on Sunday, November 11, 2018. Please bring retired or existing military ID to receive a free meal valid up to $11.99. The chain announced the Veterans Day special on the Native Grill Facebook Page. Native Grill & Wings has about 30 locations. 99 Restaurants has a free lunch on Veterans Day. From 11 am to 4 pm on Sunday, November 11, 2018, veterans and active military can choose a free lunch from the 9 Real Size Entrees for $9.99 Menu. You can find the full Veterans Day menu and more details at the 99 Restaurants Veterans Day website. 99 Restaurants has about 100 locations in the Northeastern U.S.
O’Charley’s has a free $9.99er entree for all veterans and active military personnel on both Sunday and Monday, November 11 and 12, 2018. The chain announced the special on Facebook. O’Charley’s has about 230 locations. On the Border has a free Combo Meal for all veterans and active military on Veterans Day. The free meal is good at participating locations on Veterans Day, Sunday, November 11, 2018. One free meal per person. Show proof of military service. Dine-in only. Beverage, tax and gratuity not included. *Veterans with proof of military ID or service receive a free create your own combo 2 entrée. Valid on Sunday, November 11, 2018. Dine-in Only. Beverage not included. Not valid with any other offer or promotion. Offer may vary by Market. At participating On The Border Locations. For complete details see the On the Border Veterans Day announcement. On the Border has about 160 locations. Orange Leaf Frozen Yogurt has free frozen yogurt for Veterans Day. On Sunday November 11, 2018, all veterans and active duty military are entitled to a free frozen yogurt with military ID. Coupon is also required; CLICK HERE for your Orange Leaf coupon. The Veterans Day offer was announced on the Orange Leaf Veterans Day Page. Orange Leaf has about 200 locations. This Veterans Day, Outback Steakhouse is again honoring all active and retired military members with a free Bloomin’ Onion and a beverage by showing a valid military ID at participating restaurants on Veterans Day, Sunday, November 11, 2018. Outback announced the Veterans Day special on Facebook. Outback has about 978 locations. *Buy one main entrée or salad and receive a second entrée of equal or lesser value free, 11/12/18 only, at participating P.F. Chang’s restaurants excluding Hawaii, Puerto Rico, airport locations, and international locations. Must show military ID to redeem. Valid for dine-in purchases only. Charges for modifications not included. Does not include entrées on the Chang’s for Two or catering menus. Limit one redemption per table. Must present military ID (active or retired). Cannot be combined with any other reward or offer. This offer is not applicable to third party delivery services’ orders. No substitutions and no cash value. Void where prohibited. PF Chang’s announced the veterans BOGO on Facebook. PF Chang’s has about 2,10 locations. To thank those who serve this Veterans Day, Pilot Flying J, the largest operator of travel centers in North America, is treating active-duty and retired military veterans to a free breakfast on November 10-12, 2018. This includes a free Pilot Coffee of any size with a choice of a PJ Fresh breakfast sandwich, packaged pastry item or a Cinnabon Center of the Roll. To get the Veterans Day deal, download (or open) the myPilot app Nov. 10-12 to find a coupon in myOffers waiting to be redeemed. First-time users receive an additional free drink of their choice when downloading the app. Pilot and Flying J announced the Veterans Day deal on Facebook. Pilot and Flying J has about 750 Travel Centers in North America. All military veterans and active duty personnel with valid military ID can receive 50% off their order at Red Hot & Blue restaurants on Monday, November 12, 2018. Discount is limited to $10. *Cannot combine with other discounts or offers. Valid for uniformed military or by showing any of the following: Military ID Card, Veterans ID card, DD 214, DD 2765, Driver’s license with veterans designation. Good at participating locations. Red Hot & Blue announced the special on Facebook. Red Hot & Blue has about 17 locations. Red Lobster announced the Veterans Day deal on Facebook. The seafood chain has about 700 locations. Red Robin has a free Tavern Double Burger with Bottomless Steak Fries on Veterans Day. No purchase required. Dine-in only. Valid for all veterans and active-duty service members. Proof of service required. Red Robin is known for its innovative selection of more than two dozen craveable, high-quality burgers, including the Red’s Tavern Double burger. The offering features two, fire-grilled beef patties topped with melted American cheese, house-made Red’s Secret Tavern Sauce, fresh lettuce and tomato on a toasted sesame bun. Every Red’s Tavern Double burger is also served with Bottomless Steak Fries, which means unlimited refills. *No purchase necessary. Free Red’s Tavern Double Burger does not count as an item for Red Robin Royalty. At participating Red Robin restaurants. Dine-in only. Valid Sunday, 11/11/18 only. Valid for all Veterans and active-duty service members. Proof of service required. Not valid with any other offer or discount including Red Robin Royalty®. For more details see: Red Robin Veterans Day. Red Robin has about 538 locations. Ruby Tuesday is offering a free* appetizer up to a $10 value to all veterans, active duty and reserve military service members on Veterans Day. Terms: *Receive one free appetizer up to $10 in menu value. Excess value is the responsibility of customer. Valid for dine-in only on 11/11/2018 for veterans, active duty, and reserve service members with presented valid military ID. Limit: One appetizer with valid military ID. May not be combined with any coupons. If applicable, discount will be applied to the item of least value. Coupons cannot be duplicated and have no cash value. Excludes Guam, Hawaii, Manhattan, airport, and international locations. The chain announced the Veterans Day special on the Ruby Tuesday Home page. Ruby Tuesday has about 600 locations in 41 states. Shoney’s has a free all-you-can-eat breakfast for all veterans and active military. The free meal is good only from 6 am to 11 am on Veterans Day. One free meal per person. Show proof of military service. Dine-in only. Beverage, tax and gratuity not included. Shoney’s announced the free Veterans Day meal on Facebook. Shoney’s has about 150 locations. Sizzler has a free lunch for active and retired U.S. military service members this Veterans Day. Good at participating locations from open until 4pm on Sunday, November 11, 2018. Choose from a 6oz steak entrée, single Malibu chicken entrée, or Crispy shrimp entrée. For more details see the Sizzler Facebook Page. Sizzler has about 270 locations. Sonny’s BBQ is offering free BBQ to veterans or active-duty military personnel on Monday, November 12, 2018. Get one free pork Big Deal combo per active military or veteran with a valid ID on 11/12/18. Dine-in only.The chain announced their Veterans Day deal on the Sonny’s BBQ Website. Sonny’s BBQ has about 113 locations. Friday, November 9 through Sunday, November 11, 2018, buy one lunch or dinner and get another free at Spaghetti Warehouse. Must present this coupon. Buy one, get one free coupon valid on Lasagne, Original Recipe Spaghetti, or Chicken Alfredo entree. Served with sourdough bread and soup or salad at lunch and dinner. Spaghetti Warehouse announced the Veterans Day BOGO on their Home Page. Spaghetti Warehouse has about 70 locations. Texas de Brazil has a free dinner for up to 2 veterans per table and 20% off for up to 6 additional guests at the table on Sunday and Monday, November 11-12, 2018. *Valid Sunday, November 11, 2018 and Monday, November 12, 2018 during dinner hours of operation only. To receive offer, guest must mention to server before dining and provide military ID. Offer valid for 2 veterans or active-duty military to dine complimentary plus 20% off the regular dinner price for up to 6 additional guests. Valid up to 8 people total with discount per table/reservation. Does not include alcoholic and/or non-alcoholic beverages, desserts, tax or gratuity. Not valid for lunch, salad-area only dinner or discounted children’s prices. Cannot be combined with any other offers or white gift cards. Dine-in only. Reservations HIGHLY recommended. Valid in the continental United States only. For more details see the Texas de Brazil Veterans Day page. Texas de Brazil has about 50 locations. Texas Steakhouse has a free meal for veterans from 11 am to 10 pm on Monday, November 12, 2018. Choose from a special menu. ID required. For more details see the Texas Steakhouse Facebook Page. Texas Steakhouse has about 15 locations. Get a free classic waffle with this Waffle House coupon good now through November 30, 2018. CLICK HERE for your Waffle House coupon. Print and give to your server when ordering to get one free classic waffle. The chain announced the Veterans Day deal in This Email. Waffle House has about 2,100 locations in 25 states. White Castle is offering a free Combo Meal to all veterans and active military members who dine in or visit the drive thru at one of the nearly 400 participating White Castle restaurants nationwide. The special offer is valid on both November 11 and November 12, 2018. All past and current members of the U.S. military can receive a free Combo Meal (#1 – 6) or any Breakfast Combo Meal on Sunday, November 11, and Monday, November 12, at participating White Castle restaurants. White Castle encourages veterans and those currently enlisted to join White Castle on either day for recognition of their service to our country. No purchase is necessary to claim the offer, simply provide your military ID. The chain announced the Veterans Day deal in a Press Release. White Castle has about 400 locations. Veterans get a free Chili Dog, small fries and a small Pepsi on Veterans Day at Wienerschnitzel. The chain announced the annual special on the Wienerschnitzel home page. Wienerschnitzel has about 358 locations. Veterans get a free draught beer where legal, or $5 off your check at World of Beer on Veterans Day. The chain announced the annual special on Facebook. Veterans ID Required. Zoe’s Kitchen has a free entree for the military on Monday, November 12, 2018. Good only at participating cafes; must show Military ID; valid 11/12/2018 only while supplies last. Zoe’s has about 200 locations. The chain announced their Veterans Day deal on Facebook. Note: To redeem most of these offers, you will need to show proof of service, such as a valid military ID or Veterans Organization Card (i.e., American Legion and VFW). Wearing a uniform or showing a photo of yourself in uniform is also accepted as proof of service at most restaurants. Before you head out, check with your local restaurant to confirm the military discount is available and what ID is required.